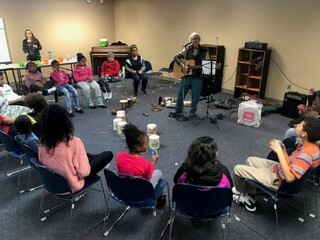 Musician Jim McGee led 10 two-hour sessions of the Music and Rhythm group in November and December 2018, which engaged kids in performance of diverse indigenous music of Kentucky including gospel song, freedom song, blues, call and response spirituals, jug band, jazz, KY fiddle tunes, holiday songs, kids songs R & B, and hip hop percussion. The goal of the group was to engage the kids in creating musical performances and expressing themselves through singing, percussion, movement, body rhythm, word rhythm. The kids had a chance to try out new instruments such as bass guitar, digital beat pad, drum set, hand drums, djembe, conga, bongo, and Native American hand drum hand held rattles shakers/world percussion instruments. Everyone had a chance to be a part of the band, and participants took turns on the instruments. The kids were eager to try the bass guitar, drum set, digital beat pad and microphone and shared the time with each other on these instruments/musical equipment. Jim McGee shares some memories from this wonderful experience made possible by Fund for the Arts! “I want to describe my interaction with the kids and performance of some of the songs over the 10 sessions we had in November and December. The group made egg shakers out of plastic Easter eggs with beans and lentils inside, and created a group performance of the song “Shake It Off” as everyone played their homemade shaker. We talked about recycling and re-purposing things for the sake of music and art. The group played some of the music they were familiar with at church, such as “You Got to Move,” “Can’t Nobody Do Me Like Jesus,” “Jesus on the Mainline” and “Show Me the Way.” The kids had the opportunity to play the drum set, digital beat pad, electric bass, hand drums, and to sing or rap at the microphone. One girl got on the drum set and played great rhythm through the whole gospel music jam—I told her she was the keeper of the beat. Many of the girls and some guys took turns playing the bass guitar. 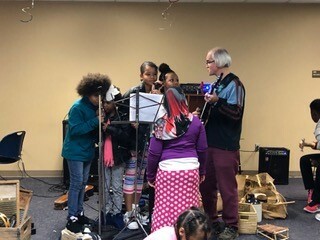 I showed them which strings, frets and notes to play on the bass for each particular song, and the kids worked at playing the right note at the right time and playing the bass as a rhythm instrument. A number of the girls wanted to sing. “Felice Navidad” was a favorite fun song that the kids engaged in singing and playing percussion; the song lent itself to many rhythm instruments including bongos, conga drum, and shakers from Ecuador, rattles from Peru, double cow bell, and washboard. While we were singing songs of the holidays, one of the guys (about age 15), who was used to singing in church, came to the mic and sang holiday songs of his choosing, including 12 days of Christmas, Away in a Manger and Silent Night. During the last two days, we worked up a performance of “Christmas Time Is Here” which a couple of the girls recognized from “Charlie Brown Christmas” TV show. Kids used percussion instruments to create the sound and feeling of snow falling. The youths who played the drum set used brushes to stir the snare drum and play the high hat and cymbal, creating the soft feeling of snow. Some of the kids played egg shakers, which we made in one of the previous groups. 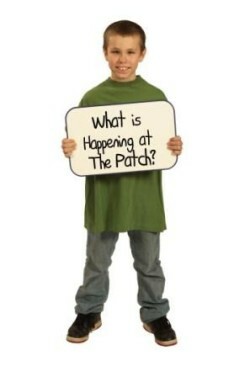 The person on the digital beat pad made pre-recorded sounds that felt like snow falling to the ground. A group of girls gathered around the mic and sang the melody, Christmas Time Is Here, while the I played jazz chords and melody on the electric guitar. This song gave everyone the feeling of the holidays. I led the group in performing the spiritual and gospel song, “Mary Had a Baby,” and a group of girls sang the call and response “Mary had a baby”…”My Lord”. Then each of the girls took turns singing the first line while everyone else sang the response. They had so much fun that we did this song twice with a reprieve. Two days were dedicated to the performance of Freedom songs from the Civil Rights Movement, including “Woke Up this Morning” One of these was “Freedom Land,” based on the spiritual “Canaan Land” which goes– “Don’t you let nobody turn you around turn you around…I’m going to keep on walking, keep on talking, marching on to freedom land.” Each person personalized the verses and named problems and obstacles they want to overcome. For instance, “Don’t you let injustice turn you around. Don’t you let no politics turn you around. Don’t you let discouragement, don’t you let negativity, and don’t you let no bullies turn you around.” Most everyone took a turn to have their say and make their own verse. We did a version of “This Little Light of Mine” in a minor key, which comes from the movie Selma. I sang the song and played electric guitar, and then invited the group to sing along. An older teenager took the mic and sang the song improvising verses to it, while I played guitar and a girl played the drum set; someone was on the beat pad and the base guitar. After we finished, the singer started the song up and we sang it again. We did bluegrass versions of Christmas songs like Jingle Bells, Joy to the World and Frosty the Snowman, while the kids sang. The kids also played world percussion instruments to KY fiddle tunes. As I was walking out the front door, there were four guys in the entryway who asked what instrument I had on my back. I replied, It is a banjo. I took the banjo out and played them a tune, while they kept time, moving and dancing.